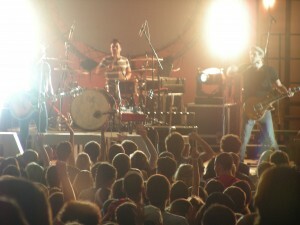 The Jordan Howerton Band teaches students new worship songs daily during the evening sessions. A Wednesday full of fun opportunities awaited the more than 2,000 students attending this year’s Momentum Youth Conference. The morning opened with Power Trax sessions, breakout groups with topics ranging from purity to postmodernism. During the morning session at Edman chapel, Gred Stier, founder and president of Dare 2 Share Ministries International, shared his remarkable background story, growing up in an extremely dysfunctional family and watching his family members come to Christ one by one. He inspired students with the story of the paralytic in Mark 2, asking, “Would you do whatever it takes to get your friends to Jesus? The afternoon opened up with several options for students, some traveling into Chicago for ministry, others staying behind to enjoy volleyball, whiffle ball, tennis, rock climbing, and other activities. Dinner was followed by more options, including a “Party on the Lawn” hosted by Lancaster Bible College, a concert by rapper Tripp Lee, and evening session also featuring Tripp Lee. Members of the Yandong Jeil Church in Mokpo, South Korea enjoy lunch in the cafeteria at Momentum on Wednesday. While the conference has always welcomed dozens of churches from across the U.S., this year they are joined by young people from Yangdong Jeil Church in Mokpo, South Korea. “We always work with the same church in South Korea — we’ve had a partnership with them for seven or eight years,” explained Kimberly Kim, director of global initiatives at Grace College, who partnered with the church to send the youth group to Momentum. Ten students from from Yandong Jeil Church are attending Momentum, ranging from middle school to high school, with Pastor Beoung Real Choi. 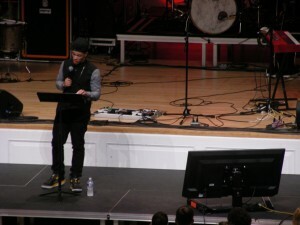 Rapper Tripp Lee talks about the difference between works and faith in Jesus at Wednesday’s evening session. “The worship [sessions are] my favorite so far,” said eighth grade student Ye Jin Seong. 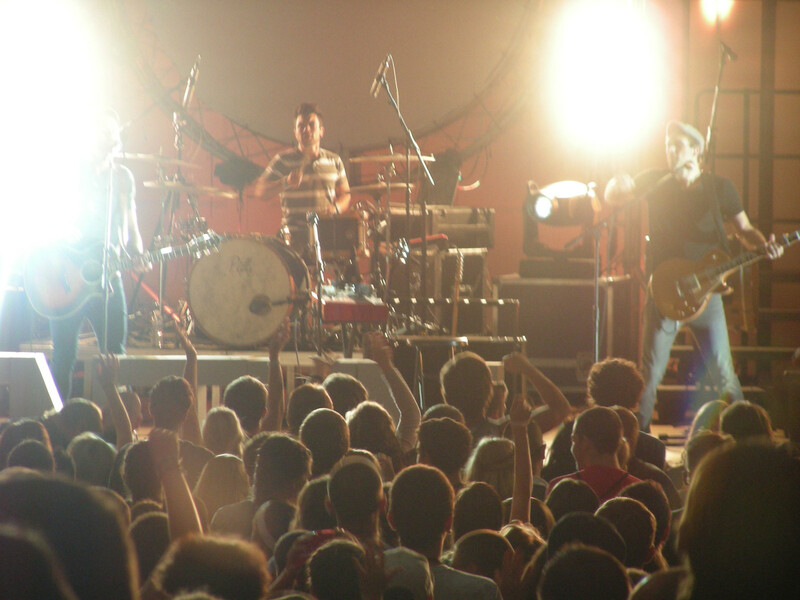 This year’s Momentum Youth Conference is held this July 22 – 27 at Wheaton College in Wheaton, Il. Speakers include Kyle Idleman, Sean McDowell, Afshin Ziafat, Jeff Bogue, Greg Stier, and Clayton King. The event, sponsored by CE National, continues through Sunday morning. Feature Photo: Students enjoy a volleyball game during free time.